Tropical Hideaway is a luxurious boutique style property, offering accommodation in the ‘Tropical Hideaway Villa’, consisting of the fabulous ‘Infinity Studio’ on the lower pool level and the incredible ‘PENTHOUSE SUITE’ encompassing the entire top floor. The spacious ‘Pool House’ which is fully equipped, has a second mezzanine bedroom and adjoins directly onto the stunning Infinity Pool and ‘Palm and Hibiscus Cottage’ which are both very private and enjoy the most amazing views of the Caribbean Sea. The Penthouse Suite is our most luxurious accommodation at Tropical Hideaway and offers absolute privacy and such incredible views that quite simply will take your breath away. Some guests on arrival are so overwhelmed they become speechless. The Penthouse Suite is entered through you own private reception area just a few steps away from our easy accessible car park and lush tropical gardens. As you walk through the hand carved entrance doors, there is a large and ornate cast iron spiral staircase leading up to the Penthouse Suite. At the top of the stairs you enter your indoor living and bedroom area with arguably the largest and most comfortable bed on the island. Beautifully made mahogany doors and windows compliment the ambience and a large walk-in wardrobe provides ample room for all your clothes. A library of books provide interesting reading for anyone wanting to relax in the white leather chairs and sofa. All indoor living areas and bedrooms are fully screened allowing you the convenience of a mosquito free environment. We take very seriously our guests health and well being and having a screened and mosquito free environment should be an important factor when choosing your holiday accommodation. At Tropical Hideaway you can sleep soundly at night safe in the knowledge that there are no biting insects or mosquito's in your room. Both the bedroom and outdoor living area have the latest HD 40” flat screen TV’s giving access to our in-house entertainment system supplying high definition films, TV, music and Internet radio. Usb charging points are supplied and high speed Wi-Fi is available throughout. Quality ceiling fans are fitted over the bed and lounge areas and air conditioning is available in the bedroom and indoor living area. Open the door into the shower room and here you have the toilet with the ultimate view. Careful design has allowed this beautiful bathroom to remain totally open yet remain completely private. The large, natural pebble shower has the same panoramic views as the toilet and the bathroom throughout is fitted to the highest of standards. The shower even has a sit down seat. The bathroom has a granite top, solid oak vanity unit with 'His and Her' designer sinks and a full compliment of organic bathroom toiletries, luxury linens and bath robes. An enormous outdoor living area measuring around 11m (35ft) square leads from the shower and bedroom area and this completely private and beautiful space offers the very best in Caribbean outdoor living. As our guests walk through the door many are speechless for a few moments as they take in the jaw dropping views. The views literally do take your breath taken away. The kitchen has a large upright fridge freezer, ice-maker, blender, a sink unit, 2 burner gas hob, combination microwave oven, toaster, kettle, cafetiere, espresso and coffee maker. A comprehensive range of quality cooking utensils, crockery, cutlery are supplied. The granite top moon bar is furnished with two breakfast stools allowing this lovely area to be used for Al fresco dining as well as an evening sunset bar. Two hanging chairs are the perfect companions for the moon bar and two 'Captain' rocking chairs are nearby. An authentic Thai cart wheel coffee table sits centrally under the main Ocean view arch and this is surrounded by a U shaped rattan seating area for up to 10 people. Two sun loungers offer private sunbathing. A large hammock is the perfect finishing touch to an already stunning room. As you look at the plethora of turquoise blues and greens with the whole of Admiralty Bay and the Caribbean Sea in front of you you cannot fail to be impressed. Sunsets and green flashes can be amazing and the views of the Infinity Pool are just lovely. An outside gas barbecue is available and close by is a second alfresco dining area complete with a bistro dining set and a wonderful view looking down towards the infinity pool and the Caribbean Sea. The Penthouse Suite has it’s own private gym. A spacious, light and airy room containing a ‘Life Fitness’ treadmill and Incumbent bike, a ‘Tunturi’ endurance video bike showing the latest training programmes and bike rides, a workout ball, yoga mats, a health rider and a vibration exercise training machine. These discounts are being offered on all accommodation at Tropical Hideaway and vary depending on your month of travel. E.g. 10% discounts for January, March and December, 15% discounts for April and November, 20% discounts for May to August and 30% discounts for September and October. Please note all prices shown here include the above special offer discounts. Tropical Hideaway and the Penthouse Suite have one of the finest hillside locations on Bequia and coupled with the incredible heated Infinity Pool, the spectacular panoramic ocean views & the beautiful evening sunsets, you soon realize you are enjoying, what many say, are the finest views on Bequia, from the finest accommodation on Bequia. The views are simply amazing and are forever changing as ships and yachts of all sizes and nationalities pass by on their journeys and adventures. Having two dive shops and around 24 dive sites, Bequia is a divers paradise. Our diverse marine environment includes relaxing reefs, wall dives, drift dives and even a few wrecks. You can still dive and snorkel away from the crowds in crystal clear waters with reefs that are still pristine. Our abundant and diverse sea life ranges from 100’s of species of Tropical Fish, Octopus, Sea Turtles and Sea Horses to name but a few. Bequia has it all and will satisfy beginners trying out snorkelling, scuba divers who wish to take a Padi course and experienced divers wishing to go on an exhilarating dive. Looking for an adventure? Try Discover Scuba with one of our two dive shops and enjoy a shallow reef dive with one of their experienced instructors. We now have available our brand new forty page 2016 guidebook about Tropical Hideaway and the island of Bequia. It has detailed information about local services, the fun things to do, our local restaurants, day trips to nearby islands and a wealth of other information invaluable for anyone intending to visit our beautiful Island. To read our complimentary guidebook please go to the very bottom of this page or visit our comprehensive website, read our latest 5* reviews, browse through our stunning photographs and download our complimentary 2016 40 page information guide for visiting Bequia and make your dream a reality. The bathroom with the ultimate view. Sympathetic and careful design has allowed this room to remain totally open yet remain completely private. The large, natural pebble shower has the same panoramic views as the toilet and the bathroom throughout has been fitted to the highest of standards. The shower has a sit down seat and is surrounded by a curved and sloping pebble and stone wall. The bathroom has a granite top, solid oak vanity unit, complete with ‘His and Her’ designer sinks and a full compliment of luxury organic bathroom toiletries, linens and bath robes are supplied as standard. A traditional hanging clothes dryer (Dolly maid) is supplied. The Penthouse Suite has it's own private gym with the latest equipment supplied. The Penthouse Suite has both an indoor and an outdoor living area providing comfortable relaxation and seating areas. Two swinging chairs and a swinging hammock are also supplied. A large, full size upright fridge/freezer complete with ice bucket and ice-maker is supplied. Complimentary ice is also available from the Pool bar ice maker. A two burner gas hob is fitted into the granite top moon bar and this provides a large area for the preparation and serving of meals. A quality gas barbecue is also supplied. A comprehensive range of high quality cooking utensils, crockery, glassware and cutlery is provided. A professional blender is also supplied. Enjoy Al Fresco dining either at the Moon Bar or the Bistro table and chairs with incredible views overlooking the Infinity pool and the Caribbean Sea. All rooms have private covered patio areas with stunning views and a range of outdoor furniture. The pool is private if the reservation is for an exclusive group booking. All guests can use the very large Infinity Pool, Gazebo & surrounding patio areas. The Pool is solar heated for all year round use & has a swim up bar. Voted one of the top 10 pools in the Caribbean. This was our return visit to this property as we were so impressed on our first visit and wanted to stay longer. The suite is all as described and more. Martin and Julie are brilliant hosts providing an exceptional service. Their shop on site had been expanded since our previous visit a year before and offers a wide range of groceries, beer and wine. We have never felt the need to hire a car as the taxi service is well priced and always reliable. We would have no hesitation in recommending this property to others. To be honest, it is hard enough to book for next year without adding to the ever growing five-star reviews, but we benefited from all those reviews when we were researching accommodations in Bequia, and there are several very good reasons why this special place has never had anything less than a five-star review. We have stayed in many amazing places on many islands that we have rated as 5 star, but none of them come close to Tropical Hideaway in Bequia. We stayed in the Penthouse, which was simply AMAZING, although after looking at all accommodations, I must say they are all superb, all unique, depending on your preferences. Each accommodation has good views, but for maximum privacy as well as very spectacular views choose either Hibiscus cottage or the Penthouse. Having said that, no matter which accommodation you choose, everyone enjoys those same panoramic views from the infinity pool, gazebo, and outside terrace just above pool level at any time of day or evening. I have posted a longer (much longer) review on TripAdvisor. 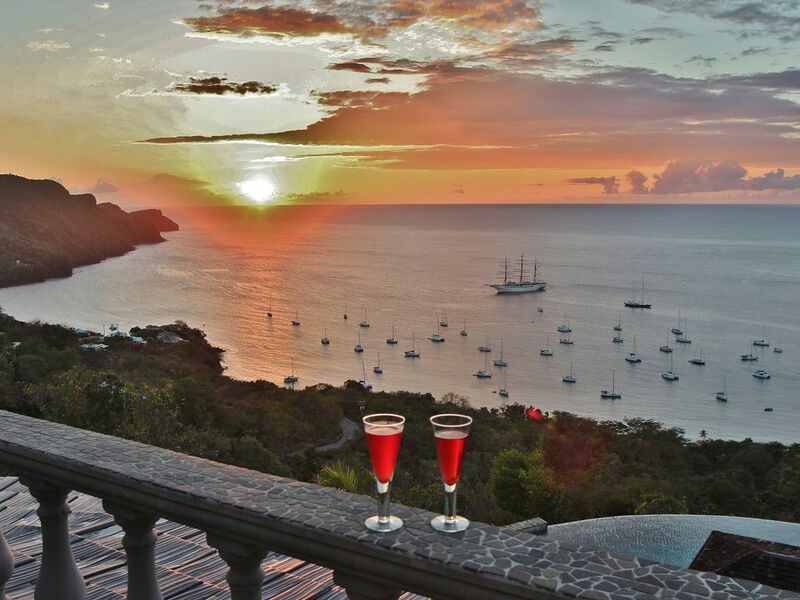 Tropical Hideway is the best place to stay on Bequia! Perfect location and fantastic views from infinity pool. The hospitality of Martin and Julie has exceeded our expectations. Highly recommend to everyone! Amazing very private accommodations with an amazing view to match. The design with natural rock open air bathroom and wonderful open kitchen/sitting/lounge area is unique & absolutely exquisite. The Tropical Hideaway is an amazing place to stay, the infinity pool has some of the most amazing views I have ever seen. We were in Bequia for our wedding and staying at the Tropical Hideaway was one of the best decisions we made. Thank You Tropical Hideaway for an amazing stay! Relax in style and luxury. The penthouse suite was just fantastic. Superbly equipped with an enormous private terrace with unsurpassed views over the bay. The owners and staff could not be more helpful or charming. Everything is about making guests feel relaxed and comfortable. If you have a sense of adventure and want a luxury break you will be hard pushed to find anywhere better.